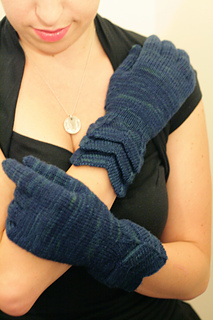 The woman of fashion wears hand-knitted gloves to go with every outfit! 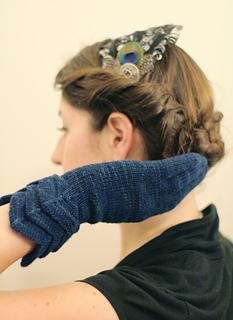 This collection of gloves was inspired by the glamor of old Hollywood. When men wore suits and fedoras and women didn’t leave home without a feathered hat on their heads and a stylish pair of gloves on their hands. The whole collection can be purchased for $15.00 here. 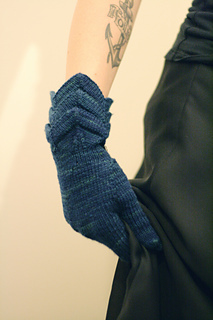 This pair, inspired by Lauren Bacall, have a series of chevron pleats, that give the gloves the refined, sophisticated city-dweller feel that so many of Lauren’s characters exuded. 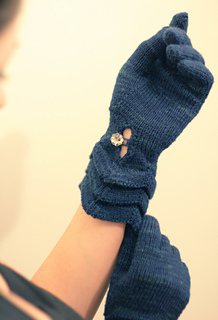 The wrist slit, when unbottoned, allows the gloves to slide easily over the hand, but when buttoned, shows off slim wrists. The gloves are meant to fit with no ease for a 7(8)” circumference, but with negative ease, will fit a larger hand circumference. The model shown is a 7” size glove on a 7.5” circumference hand. Hand circumference should be measured as shown here. Stitches used: knit, purl, k2tog, ssk, Centered Double Decrease, m1, kfb, pfb, sl wyif, sl wyib, sl2-p2togtbl. Notions: stitch markers to mark gusset, tapestry needle for weaving in ends. Scrap yarn and crochet hook for provisional cast on and scrap yarn or safety pins to hold finger stitches. Two buttons and embroidery floss in a color to correspond with the yarn. 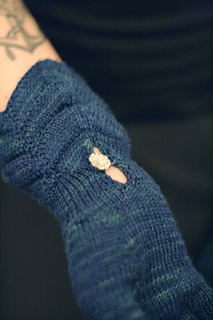 Round 22 makes a raised ridge on the outside of the cuff and an indent on the inside. The ridge on the inside that you are supposed to pick up from is the outside of the indent. The indent itself on the inside creates a ridge above it (still on the inside). 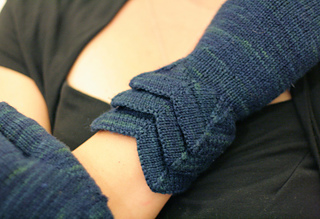 The purl row indent is what makes the stitches you need to pick up stand out. You don’t actually pick up the stitches from the purl ridge row.